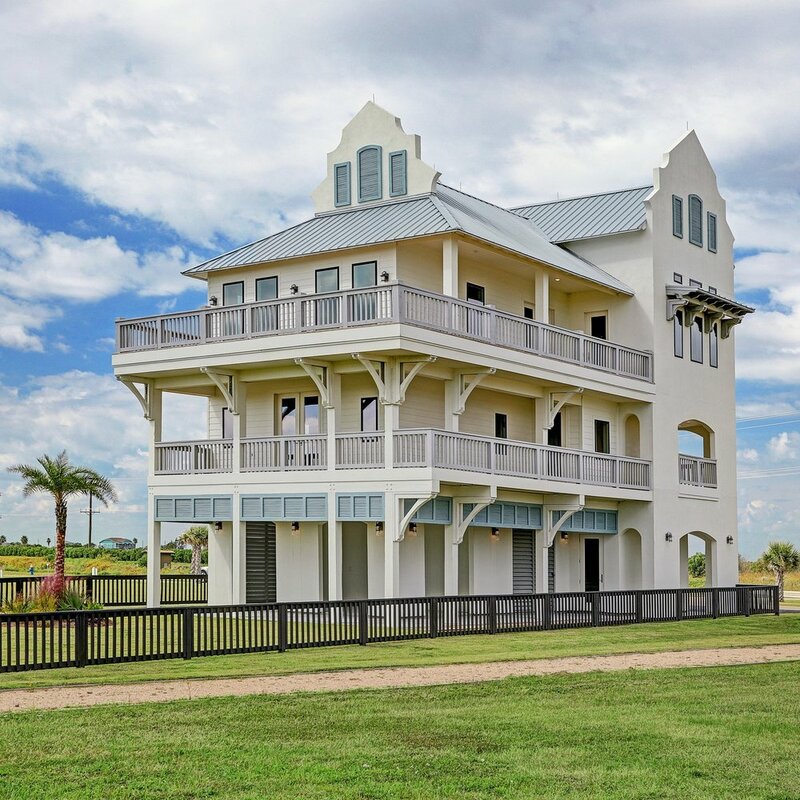 Seagrass Beach is the newest beachfront development on the Texas Gulf Coast for those who prefer to vacation away from crowds and clutter. Located on the Bolivar Peninsula near Crystal Beach, Texas, Seagrass Beach is just a short drive from Houston and Beaumont, and a quick ferry ride from Galveston. Seagrass Beach features 35 beachfront lots with unobstructed, panoramic views of the Gulf of Mexico, lush landscaping, sand dunes, fishing ponds and a resort-style pool surrounded by poolside cabanas. Seagrass Beach was designed to pair beach house vibes with resort-style luxury. This exclusive beachfront community values quality, unique architectural design, privacy, luxury and entertainment. The layout of the subdivision and orientation of the home sites reflects the overall goal for the community to be the ultimate playground for friends and family at the beach. In addition to the typical beach activities, the owners and their guests will enjoy the use of the many amenities offered by the development, including the elevated beachfront resort-style pool with an infinity edge, six poolside cabanas, lush landscaping, a fire pit and fishing ponds. The Bolivar Peninsula and Crystal Beach deliver a family friendly, relaxing, community oriented environment that allows you to roam, relax and leave your daily stressors at bay. Seagrass Beach is the family escape you can truly call home! 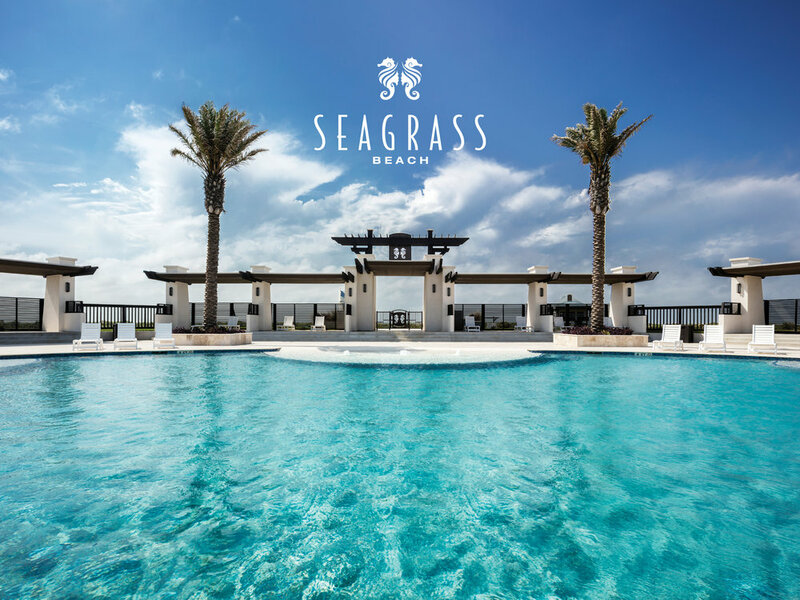 Expansive and elegant, at seagrass Beach you’ll find plenty off the fringe benefits, like bedroom views of the Gulf of Mexico, a Resort-Style pool, lush landscaping and private beach access to remind you that life is about more than emails and to-do lists. Sign up to receive news and updates on available beach houses and vacation rentals. Seagrass Beach was designed to be an exclusive beachfront community that places great value on quality, unique architectural design, privacy, luxury and entertainment. The layout of the subdivision and orientation of the home sites that surround the communal lawns and the resort-style pool area, reflects the overall goal for the community to be the ultimate playground for friends and family at the beach. Each home site at Seagrass Beach boasts unobstructed, panoramic views of the Gulf of Mexico, the lush landscaping in the common areas, the sand dunes, the fishing ponds and the incredibly beautiful pool area. Access to the subdivision is limited to the owners and their guests, via private gated entrances at the beach and highway. Beach access is limited to a single, centrally located access point, that is privately gated and only accessible to the owners and guests of Seagrass Beach that have an electronic key fob. The crushed granite pathways throughout the development are both pedestrian and golf cart friendly. In addition to the typical beach activities, the owners and their guests will enjoy the use of the many amenities offered by the development, including the elevated beachfront resort-style pool that has an infinity edge that falls over into a lower tanning pool, six poolside cabanas, two lush communal lawns, a beach side fire pit and stocked fishing ponds. The Bolivar Peninsula and Crystal Beach areas, deliver a family friendly, relaxing, community oriented environment that people dream about. Owning a home in Seagrass Beach provides the ultimate coastal living experience on the Texas Gulf Coast. When coming up with the concept for Seagrass Beach, we decided we wanted to build not only superior quality homes, but we wanted each of the homes to have distinctive architectural design that is unique to each home and cohesive to the overall theme of Seagrass Beach. To further set our homes apart, all homes in our community are being constructed to the superior engineering and construction methods set forth by the IBHS Fortified Home Gold Program. To put it simple, this means our beach houses are engineered and constructed to be much stronger and more disaster resilient than most homes on the Gulf Coast. Some our standard features include standing seam metal roofs, lighting rod protection systems, whole-house dehumidifiers, spray foam insulation, engineered wood flooring, high ceilings, led lighting throughout, stainless steel appliances and quartz countertops. Seagrass Beach is conveniently located on the Upper Texas Gulf Coast, just east of Galveston Island on the east end of Bolivar Peninsula near Crystal Beach, Texas. We are located just 1-hour from Beaumont and 1.5-hours from Houston, 5 hours from Dallas & Forth Worth, and a quick ferry ride from Galveston, Texas. From Houston, Seagrass Beach is accessible via two routes. You can avoid the ferry by driving east on Interstate 10 to Exit 828, then go south on Highway 124. Or you can take Interstate 45 to Galveston and take the ferry across to Bolivar Peninsula. The most scenic way to get to Seagrass Beach is by taking the free ferry that runs between Galveston and the Bolivar Peninsula. Riding the ferry is a great opportunity to watch schools of dolphin that frequently swim alongside the ferries, or to see many brown pelicans, sea gulls, and other marine life at play in the harbor. Ferries run the 2.7 miles between Galveston and Bolivar Peninsula on a regular schedule, and with the addition of new ferries, boarding has never been faster. People come to Crystal Beach and the Bolivar Peninsula for the clean beaches and the fishing, but this jewel of the Texas coast is also a nature lover's paradise. It provides world-class bird watching, excellent fishing, awesome shelling on the beach, great food, kayaking and much more. There's also a golf course, horseback riding, a water park and deep sea fishing charters.